“Born Pietro Ferraro in Altivole, Ferraro took his stage name from his wife's first name. He was trained by Mirko Bonomi at the Conservatorio Benedetto Marcello in Venice and by Aureliano Pertile at the Conservatorio Giuseppe Verdi in Milan. He made his professional opera début as Rodolfo in Puccini's LA BOHÈME at the Teatro Nuovo in Milan in 1951. That same year he began performing at La Scala where he sang often through 1972. His first major triumph at that house was as Achille in Gluck's IPHIGÉNIE EN AULIDE in 1959. Ferraro became a regular presence at Italy's most important houses during the 1950s through the 1970s, appearing at the Teatro dell'Opera di Roma, Teatro Comunale di Bologna, Teatro Carlo Felice, Teatro di San Carlo, Teatro Regio di Parma, Teatro Massimo, Teatro Comunale Giuseppe Verdi, Teatro Regio di Torino, and La Fenice. He also appeared at the opera festival at the Baths of Caracalla in Rome and at the Maggio Musicale Fiorentino opera festival. In addition to regularly appearing in Italy's principal opera houses, Ferraro also performed in important houses throughout Europe, including the Royal Opera at Covent Garden, the Liceu, Teatro Nacional de São Carlos, La Monnaie, Opéra National de Lyon, Opéra de Marseille, Opéra National de Paris, le Grand Théâtre de Genève, Zürich Opera, Hamburg State Opera, Staatstheater Stuttgart, and Vienna State Opera among others. He also made appearances at the Aix-en-Provence and Aldeburgh Festivals. Although most of his performances were in Europe, Ferraro did make a handful of appearances in North and South America. He notably portrayed Cavaradossi and Manrico at the New York City Opera in 1956 and starred in productions of DON CARLO, LA FORZA DEL DESTINO and IL TROVATORE at the San Francisco Opera in 1958. Also in 1958, Ferraro sang the rôle of Gualtiero in Bellini’s IL PIRATA with Maria Callas as Imogene in a concert version put on by the American Opera Society at Carnegie Hall. That performance, long prized by collectors, was ‘officially’ released on CD by EMI in 1997. The year after PIRATA, Ferraro recorded the role of Enzo in LA GIOCONDA opposite Callas in the title role. His other appearances in the Americas included performances at the Philadelphia Lyric Opera Company, Cincinnati Opera, and the Teatro Colón. Ferraro was particularly admired for his interpretation of the title role in Verdi's OTELLO, which he first sang at San Remo in 1964 and sang for his final opera performance at Lecco in 1981. All told he portrayed Otello over 300 times during his long career. “Giulietta Simionato was the greatest Italian mezzo-soprano of her era, an artist whose singular career was shaped as much by her innate elegance as by her extraordinary musical and dramatic gifts. 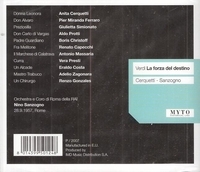 In an era before opera singers were pigeonholed as ‘specialists’, Simionato constructed a personal repertoire that stretched from the eighteenth-century graces of Mozart, Gluck and Cimarosa to the bel canto heroines (and heroes) of Bellini, Donizetti and Rossini to the formidable ladies of Verdi, Mascagni, Ponchielli and Cilèa. Today, it would be highly unlikely for an impresario to cast the same artist as Cherubino and Amneris, but Simionato sang them both - as well as Carmen, Octavian, Mignon, Berlioz's Didon, Valentine in LES HUGUENOTS and nearly one hundred other rôles. Simionato's voice, brilliant in the upper register and luminous in mid-range, was not so large as those of her Italian contemporaries, but her arresting combination of verbal clarity and emotional honesty made her one of the most charismatic artists to emerge on the international scene in the 1950s. She was a petite woman, but her superb figure and perfect posture - to say nothing of the very high-heeled shoes she favored both on- and offstage - made her seem statuesque. Simionato's characterizations, unfailingly bold yet never broad, were charged with enormous compassion: audiences succumbed as much to her generous spirit as to the sheer beauty of her sound. Born in Forlì, in Romagna, Simionato made her stage début at seventeen, in a musical comedy at the Teatro Sociale in Rovigo, and studied voice with Guido Palumbi in Padua. After a few professional appearances in small rôles, she won a singing competition sponsored by the Maggio Musicale that brought her a contract for her Florence début, in the world premiere of Pizzetti's ORSÈOLO, in 1935. The following year, Simionato began her professional association with La Scala, as a Flowermaiden in PARSIFAL. For the better part of the following decade, she was chiefly confined to comprimario rôles in Milan, a situation in part due to the seniority (and political connections) of other mezzos on the La Scala roster, such as Gianna Pederzini and Cloe Elmo. Simionato's luck began to change after she acquired new management and won good notices as Dorabella in Geneva, Octavian in Trieste and Cherubino at the Edinburgh Festival. A particularly successful 1947 engagement in Genoa as Thomas' Mignon, a character to which she was ideally suited, brought an invitation to repeat the rôle at La Scala. Simionato made an enormous hit, and her status as a major star was assured. Simionato was active at all the principal theaters in Italy but remained especially beloved at La Scala, where her legendary triumphs included Rubria in Boito's NERONE under Toscanini (1948); Giovanna to Maria Callas' Anna Bolena (1957); Didon in the La Scala premiere of LES TROYENS (1957); Valentine in LES HUGUENOTS (1962); and Arsace to Joan Sutherland's Semiramide (1962). She appeared regularly at Salzburg, where she made memorable appearances as Orfeo (1959) and Azucena (1962) under Karajan's baton, and in Vienna, Paris, Mexico City and London, where her Covent Garden appearances included Adalgisa to Callas' Norma (1953) and Azucena in Luchino Visconti's staging of IL TROVATORE (1964). Simionato made her U.S. opera début in 1953, as Charlotte to Cesare Valletti's Werther, at San Francisco Opera. San Francisco also heard Simionato as Rosina and as Marina in BORIS GODUNOV (in Italian) during her first SFO season, but she did not sing with the company again until 1962, when she returned as Azucena, Santuzza and Mistress Quickly. Like many of the leading Italian artists of her generation, Simionato considered her artistic home in the U.S. to be Lyric Opera of Chicago (then known as Lyric Theatre of Chicago), where she bowed in 1954, as Adalgisa to Callas' Norma. Simionato sang thirteen rôles in her six seasons with the company, allowing Chicago to hear a more generous sampling of her great specialties than any other North American city. In October 1957, immediately after making her New York début as Giovanna in an American Opera Society concert of ANNA BOLENA, Simionato traveled to Chicago, where she sang two performances each of MIGNON, Santuzza, Laura in LA GIOCONDA, Cherubino and the Princesse de Bouillon in ADRIANA LECOUVREUR for Lyric Opera, all within the span of a month. Six days after her final Chicago ADRIANA - during which she injured her ankle and sang Act III seated in an improvised wheelchair - Simionato made another significant U.S. début, when she appeared in L'ITALIANA IN ALGERI during the inaugural season of Dallas Civic Opera. Two weeks after her final Dallas ITALIANA (on 24 November), Simionato opened the La Scala season, as Ulrica in a brand-new UN BALLO IN MASCHERA. Such a rigorous schedule was business as usual for the fiercely disciplined Simionato, who typically sang eighty performances a year during the 1950s - and rarely canceled. In 1954, the Met announced that Simionato would make her company début that season, as Orfeo, but she canceled her scheduled appearances, ceding the run of Gluck's opera to Risë Stevens. Simionato finally arrived at the Met on the opening night of the 1959–60 season, when she was Azucena in a new TROVATORE, directed by Herbert Graf. Despite her acclaim from the New York press and a significant number of devoted fans in Manhattan, Simionato sang just twenty-eight performances in four seasons with the Met - twelve as Amneris, six as Azucena, five as Santuzza and two as Rosina in BARBIERE, plus three 1965 tour performances of SAMSON ET DALILA, in which she sang Dalila in Italian, while the rest of the cast sang in French. The SAMSON presented during the 1965 spring tour's stop in Detroit marked Simionato's final Met performance and her final opera performance in the U.S. The following season, when her second marriage, to the celebrated Italian physician Cesare Frugoni, was about to take place, Simionato decided to retire from the opera stage. She chose the thirtieth anniversary of her La Scala début – 6 February, 1966 - as the date. When she learned that the opera on the Scala schedule that night was Mozart's LA CLEMENZA DI TITO, Simionato learned the soprano rôle of Servilia in a few days and did a single performance of the opera at Piccola Scala. She did not sing in public again, save for a 1979 gala in honor of Karl Böhm, the maestro who had paced her first Cherubino, some thirty-two years earlier; in tribute to him, Simionato sang ‘Non so più’, transposed down an octave. Simionato enjoyed a long and comfortable retirement, frequently serving as a competition adjudicator and relishing the opportunity to comment on the state of singing in the years after she left the stage. After Frugoni's death, in 1978, Simionato married industrialist Florio De Angeli, who died in 1996.